Russian Prime Minister Dmitry Medvedev on Thursday approved a draft agreement with Egypt that will allow Russian warplanes to operate from Egyptian air bases, and vice versa, for at least five years. “Egyptian President Abdel-Fattah el-Sissi’s government has expanded military ties with Russia and signed deals to buy Russian fighter jets, helicopters, and other weapons,” the Associated Press notes. There are also tensions with Egypt over Sisi’s support for strongman General Khalifa Hifter in Libya, since the U.S. and most of its allies support that war-torn country’s unity government. The NYT suggests this angered the Egyptians enough to look for closer ties with Russia, driven also by America’s “diminishing international influence as President Trump has pulled back its military and diplomatic footprint around the world.” It notes that the Trump administration lacks an assistant secretary of state for Near Eastern affairs and an ambassador to Egypt. 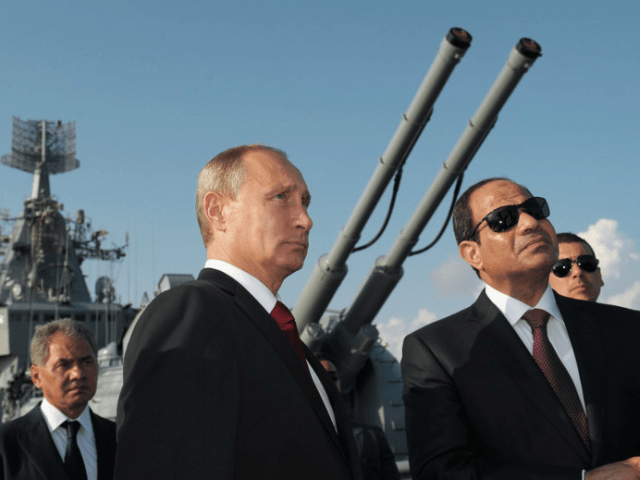 Later in the article, however, the Times recalls that the Obama administration also suspended military aid to Egypt in response to mass shootings in 2013, which prompted Sisi to consider “upgrading cooperation with Moscow” after forty years of alliance with the United States. Warnings were issued at the time that Egypt would turn to Russia to replace the weapons the Obama administration refused to provide. Obama disregarded warnings that his refusal to accept Sisi’s coup against the Muslim Brotherhood would drive the Egyptian president into the orbit of Russian President Vladimir Putin, who was quick to endorse him as Egypt’s leader. Russian Defense Minister Sergey Shoigu arrived in Egypt on Wednesday for the fourth session of the Russia-Egypt Military Technical Cooperation Commission, and to meet with Egypt’s top military officer and President Sisi himself. “In May, in course of negotiations with Sedki Sobhy in Cairo, Sergey Shoigu stated that Russia had proposed interesting military technical cooperation projects,” said a statement from the Russian Defense Ministry. “During the meeting, Sisi hailed the close relationship between the two countries and expressed his desire to strengthen those relations at all levels, particularly the military level,” Egypt Today reported. Egypt Today mentions that Shoigu’s previous visit to discuss military cooperation in visit occurred last May, which further disputes the notion that Egypt began moving closer to Russia during the Trump administration. More than military cooperation is involved in the relationship. Trade between Egypt and Russia rose from $2.2 billion to $2.5 billion in the first half of 2017. Egypt is making plans to establish a logistical center in Russia to help distribute Egyptian products through the Russian marketplace. The two countries are working on a number of major projects together, including a $30 billion nuclear power plant.